If you don’t like to wait, just don’t go to Habana. Most businesses there are owned by the State and you’ll find yourself constantly dealing with civil servants who have a job guaranteed and just have no idea how things happen in a capitalistic society based on time and competition. Basically, they don’t give a s**t.
Once you take this for granted, you can lean back and enjoy, as it was before marketing took ahold of our entire life, taking into the picture concepts like “customer-satisfaction”, “time-to-market” and “shopping experience”. This way, you may find that waiting in line for two hours to exchange money in the local currency gives you the chance to hold brilliant conversations with people you may never know otherwise. Or you may think that, after all, one hour line to get a one-hour card for Internet access is just not worth it. A fine ceramic odalisque greets the guests at the Hotel Florida. Nikon D810, 31 mm (24-120.0 ƒ/4) 1/100″ ƒ/4.5 ISO 3200. Palacio des los Capitanes Generales. Nikon D810, 24 mm (24-120.0 ƒ/4) 4″ ƒ/4 ISO 400. The “Rooster Rider”, a sculpture of Roberto Fabelo surprises the tourists in Plaza Vieja. Nikon D810, 70 mm (24-120.0 ƒ/4) 1/100” ƒ/4 ISO 3200. Two friends throw a game of chess in the old town. Nikon D810, 70 mm (24-120.0 ƒ/4) 1/100″ ƒ/4 ISO 3200. Slow renovation, Habana Vieja. Nikon D810, 24 mm (24-120.0 ƒ/4) 1/500″ ƒ/7.1 ISO 800. A vintage car in the old town. Nikon D810, 24 mm (24-120.0 ƒ/4) 1/1000″ ƒ/5 ISO 1250. The old headquarters of the Red Cross. Nikon D810, 30 mm (24-120.0 ƒ/4) 1/500″ ƒ/11 ISO 800. Waiting for spear parts. Nikon D810, 50 mm (24-120.0 ƒ/4) 1/400″ ƒ/4 ISO 64. “La Conversacion”, the sculpture donated by Vittorio Perrota, facing the Basilica Menor de San Francisco de Asis. Nikon D810, 30 mm (24-120.0 ƒ/4) 0,5″ ƒ/9 ISO 400. Lonja del Comercio in Plaza San Francisco de Asis. Nikon D810, 120 mm (24-120.0 ƒ/4) 1/200″ ƒ/22 ISO 800. Fuente de Los Leones, by Giuseppe Gaggini, in Plaza San Francisco de Asis. Nikon D810, 24 mm (24-120.0 ƒ/4) 1/500″ ƒ/8 ISO 100. Basilica Menor de San Francisco de Asis. Nikon D810, 20 mm (20.0 ƒ/1.4) 1/500″ ƒ/4,5 ISO 100. La Bodeguita del Medio, unavoidable stop for fans of Ernest Heminguay. Nikon D810, 24 mm (24-120.0 ƒ/4) 1/100″ ƒ/5.6 ISO 2000. Rain drops falling near Plaza de la Catedral in Habana Vieja. Nikon D810, 120 mm (24-120.0 ƒ/4) 1/100″ ƒ/7.1 ISO 2000. Catedral de San Cristóbal in Habana Vieja. Nikon D810, 46 mm (24-120.0 ƒ/4) 0,6″ ƒ/5 ISO 200. Motorcycle on the Malecón. Nikon D810, 120 mm (24-120.0 ƒ/4) 1/50″ ƒ/11 ISO 64. 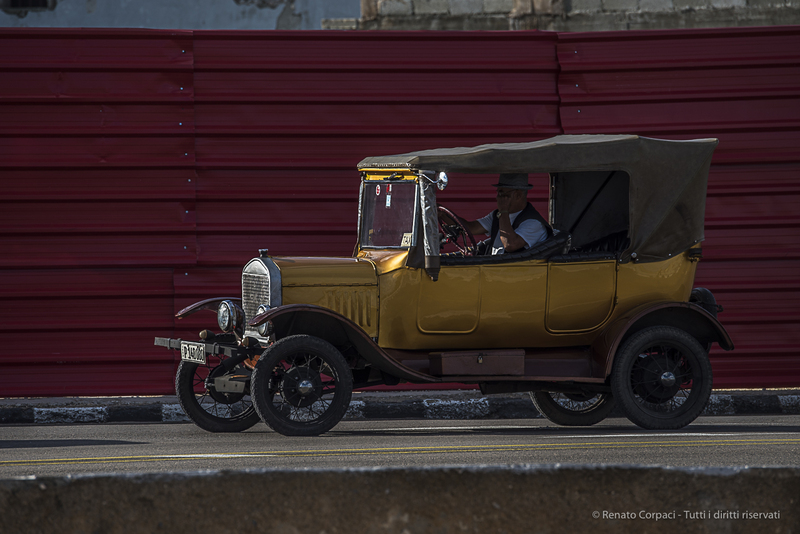 Vintage car on the Malecón. Nikon D810, 86 mm (24-120.0 ƒ/4) 1/50″ ƒ/18 ISO 64. Hotel Nacional, on Calle 23 (Rampa) and Malecón. Nikon D810, 24 mm (24.0 ƒ/1.4) 1/200″ ƒ/8 ISO 200. Monument to Omar Torrijos, Avenida de los Presidentes. Nikon D810, 24 mm (24-120.0 ƒ/4) 1/200″ ƒ/20 ISO 400. Jose Miguel Gomez memorial breacks the perspective in Avenida de los Presidentes. Nikon D810, 24 mm (24-120.0 ƒ/4) 1/200″ ƒ/18 ISO 400. Plaza de la Revolution. Nikon D810, 50 mm (24-120.0 ƒ/4) 1/200″ ƒ/10 ISO 400. A secular tree in the Castillo del Morro. Nikon D810, 20 mm (20.0 ƒ/1.8) 1/13″ ƒ/9 ISO 64. Avenida del Puerto. Nikon D810, 85 mm (85.0 ƒ/1.4) 1/8″ ƒ/9 ISO 64. The sunset over the Habana skyline from the Castillo del Morro. Nikon D810, 20 mm (20.0 ƒ/1.8) 1/13″ ƒ/9 ISO 64. Se non vi piacciono le attese, non andate all’Avana. La maggior parte degli esercizi sono statali e le persone con cui avrete a che fare sono impiegati statali con uno stipendio garantito che non hanno semplicemente idea di come vanno le cose in un sistema economico che si basa sulla tempestività e sulla concorrenza. In pratica, non gliene può fregà de meno. Assodato questo, potete rilassarvi e godervi la vita di prima che il marketing ci allietasse con concetti come “customer-satisfaction”, “time-to-market” o “shopping experience”. Così potrebbe capitarvi di scoprire che fare la fila per due ore per cambiare i soldi in valuta locale può essere occasione per ingaggiare brillanti conversazioni con persone che altrimenti non avreste mai potuto incontrare. O arrivare alla conclusione che fare la fila per un’ora per procurarsi una card che permette un’ora di accesso a Internet, semplicemente non vale la pena.